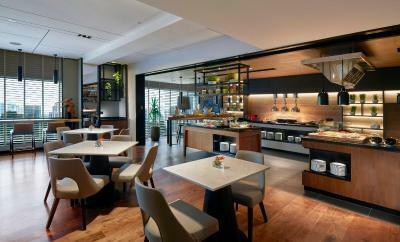 Lock in a great price for Renaissance Kuala Lumpur Hotel – rated 8.4 by recent guests! Amazing variety at breakfast. 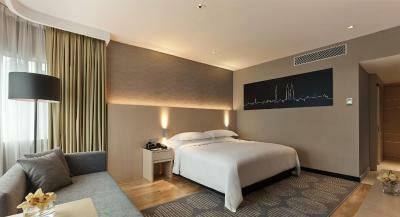 Good location, just a short walk away from the Petronas towers and the monorail. ALL of them was wonderful! Breakfast,pool,room,staff,location !!! Very spacious and clean. Great variety of food available for breakfast. Pool was big and relaxing. Friendly and helpful staff. Good location. Friendly staff. 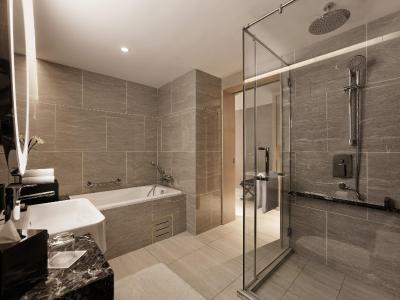 Facilities include sauna, steam room and jacuzzi. Breakfast is very chaotic exercise every morning. The restaurent is very small for the size of the hotel. There are large groups of tourists vying for space. The hotel staff are rude and do not care about the guests at all. Quality is just acceptable, with a few nice items. Service is non-existent. 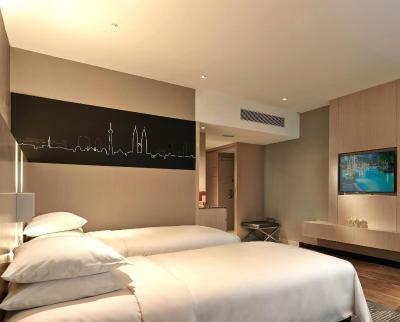 Renaissance Kuala Lumpur Hotel This rating is a reflection of how the property compares to the industry standard when it comes to price, facilities and services available. It's based on a self-evaluation by the property. Use this rating to help choose your stay! One of our top picks in Kuala Lumpur.Housed in 2 modern wings, the luxurious Renaissance Kuala Lumpur is located 1,650 feet from Petronas Twin Towers. Overlooking views of the city, it has an outdoor swimming pool and guests can enjoy meals from 5 of the in-house restaurants or have a drink at the bar. Free WiFi is available throughout the property. 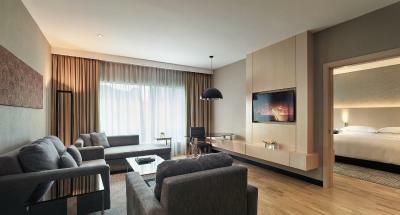 Stylish and elegant, rooms at Renaissance Kuala Lumpur hotel feature floor-to-ceiling windows and a cable TV. 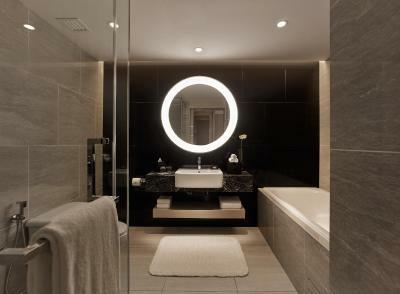 En suite marble bathrooms come with both bathtub and shower facilities. At Mandara Spa, guests may enjoy a massage or relax in the sauna. 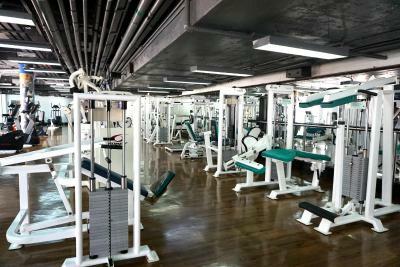 Other recreation facilities include a fitness center and tennis courts. Laundry and dry cleaning services are available upon request. Many shopping complexes are found within a 10-minute walk from Renaissance Hotel. Located next to Bukit Nanas Monorail Station, guests can take the monorail and alight at Bukit Bintang Station to reach Pavilion Kuala Lumpur and Sungei Wang Mall. Suria KLCC Mall is within a 10-minute walk away while Kuala Lumpur International Airport is a 60-minute drive from the hotel. The award-winning Dynasty Restaurant features pork-free Cantonese cuisine, while TEMPTations offers authentic Asian and international fare available in both buffet and a la carte. The Poolside Gazebo serves up cocktails, tropical fruit juices and a variety of light refreshments. 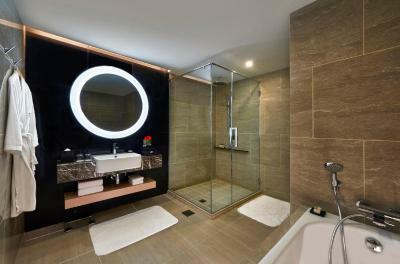 This property also has one of the top-rated locations in Kuala Lumpur! Guests are happier about it compared to other properties in the area. 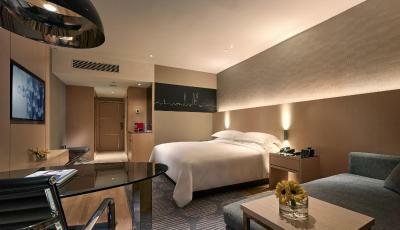 When would you like to stay at Renaissance Kuala Lumpur Hotel? Private parking is available on site (reservation is not needed) and costs MYR 10 per day. This double room features air conditioning, bathrobe and view. 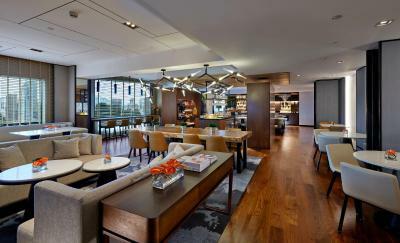 House Rules Renaissance Kuala Lumpur Hotel takes special requests – add in the next step! All children under 12 years are charged MYR 150 per night for extra beds. 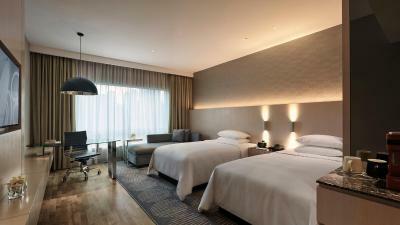 Any additional older children or adults are charged MYR 150 per night for extra beds. Renaissance Kuala Lumpur Hotel accepts these cards and reserves the right to temporarily hold an amount prior to arrival. Playground equipment was dirty, so made clothes filthy. Staff were friendly and welcoming, breakfast was great, bed was super comfy, pool was great, and location was excellent! communication with staff, got a smelly and uncleaned room, I have been told by one staff they do not have other room available, when I went to ask 15minutes later and managed to talk to other receptionist I got a few options for other room, I managed to change a room but air condition was not working, it took 24hrs to fix it and cost me 12 phone calls to reception and 5 times I had to go down to complain to the main reception. I have been over charged by hotel. The whole place feels very run down and definitely needs a make over. For me personally this is not Renaissance standards. Our room was rather dusty and overall not really that clean. Being the last stop of our honeymoon...we were hoping for the same level of service we had received in the Bali Marriott days before but the service element was miles apart...with the only exception being the Balinese lady serving at the lobby lounge on the wedding as we waited for the room to be ready. Upon arrival (after 4pm) we were informed we would be "upgraded" to a room with Twin beds which we thought strange thing to offer honeymooners. When we told them we would prefer a king bed they informed us we would have to wait 40 mins for the same which we did not mind and it helped that they offered us a drink in the lounge. Once we got our key we proceeded to our room 1219 on the east wing and the musty smell in the hallway was really overbearing...the room was a good size and the view amazing. Some of the lights did not work and first day we had to call down for the water to be checked as it was cold to warm...our luggage as well was not sent up until we called for it... So the stay was OK...not good or great. The staffs were nice and friendly and always tried for helping us. Its my 1st time stay at the Renaissance hotel, but it nt what i expected!i was arrived at the hotel at 3pm,and expecting the room is ready but its very dissappointed the room nt ready yet until i have to wait 1 and half hours almost 4:30pm check in????!!! !and another the room service just open our room without press the button, just to inform check out time and its weird that time was 11:30am,I was checking in late and when I wanted to check out a little bit late you can’t promise me, yes i understand that.but still have time to check out.totally rude the person entering our room like that!! The room a bit old and the room amenities is most outdated. Barely hear next room talking. Great location, beautiful rooms in the west wing, buffet breakfast was absolutely amazing and so yummy. 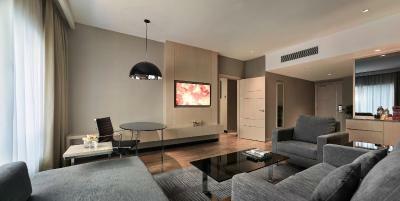 The property was in excellent condition, we had a newly renovated room.